It is difficult to picture the fashion world without Lee Alexander McQueen. I'd like to imagine him having tea right now with his mother and Isabella Blow, in some fantastic, hat filled afterlife. Shalom's spray painted ballgown, Kate's angelic hologram, and Deconstruction. Posted by la femme at 2:44 p.m. Yes, this was sad news. I was in Paris the day YSL died and it was such a city-wide, end-of-an-era moment. It was the right place to be to absorb and digest this news. There was even a special edition of the newspaper. Hearing the McQ news made me wonder where one should have been to hear it. NYC wasn't the place -- perhaps London? Yes, I think London would have been the place. what more can you asked? i will miss his amazing collections! Thanks for the tip! I've used it on my blog now. 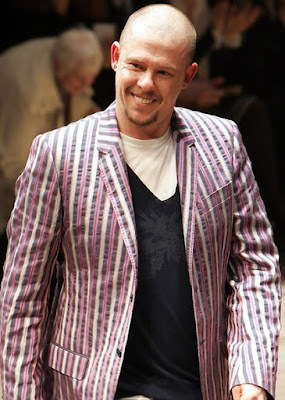 rip alexander mcqueen. he was a brilliant artist. You exactly described the right thing. Best wishes from me also. Good to visit you. Sure. Dashing now - will add you later today. I know, it's so sad... that's a nice thought though. Thank you Alexander for your vision, inspiration and art.